So You Want To Start a Self Storage Business? The self storage business has really boomed in some countries recently, as it has become a rapidly in demand solution for keeping hold of possessions for all sorts of customers. You might be thinking that this is in fact very easy – take over a warehouse, split it up into units, and do your best to attract people to make use of those units, working on a few unique selling points and some attractive offers. However, there are quite a few responsibilities on your back being in charge of a self storage facility, not least that you are essentially looking after people’s things for them and you have to be fully certain that you are doing your best to keep all this property safe. Looking for a site to run your business is not the only first step. As you are setting up a business, you need to scope out where you sit on the legal side of things. Do you need to apply for a special license to use premises in this way? What sure of insurance applies to those running self storage, and what are the best practice terms under which to operate here? And as for any business, getting the tax formalities sorted out and registering the business through the proper channels also needs to be done. What is the business plan, how will it grow, how many staff are you going to employ to make it all happen? So you are in fact going to have to sit down with a few business advisers in order to get this show up and running, before ploughing on with the real nitty gritty. Whilst that is being sorted out, the location of the self storage facility needs to be chosen carefully. Obviously it needs to be in a place where there is demand for it, but not where the market may be showing signs of saturation. The scale of the business and the size of the units needs to be worked out. You are going to have a few long evenings sketching out the best arrangement for the units, both in a practical sense and in a business sense. Giving customers choice and flexibility will need to be a factor in order to stand out from the crowd. Once you have got all that planned, time to get the builders in. Or at least, time to have a word with some companies that specialise in this field in order to get some quotes in and get a feel for who will be able to do the job in a professional and stress free manner. 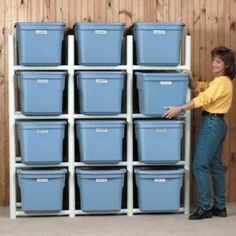 Consider how you will make provision for the storage project, where materials themselves can be kept and so on. The matter of keeping the storage centre at a steady temperature will also need to be attended to, as will the method of controlling this. The storage centre also needs to be a safe place to work and visit, with areas kept clear and well lit – corners cannot be cut in this respect. And obviously security arrangements are very important – ensuring you have done everything to ensure that access is tightly controlled with modes of access and CCTV installation. So there is a lot of practical work that needs to be taken into account as well as the business end of things. Once you have a building up, it’s now time for the final push. In some parts of the world, self storage is becoming a very competitive market, and you will need to conjure up some effective advertising that will convince people that your new setup is the first place to consider. Get yourself out there as much as possible, it’s not all about getting a website up and a phone number in the local directory, but ensuring you stand out in local press and trade publications. Generous introductory offers, whilst they might restrict initial profits, will get people on board and start your business on the right footing.